So the time has come! Back to workkkkkkkkkkk!!!! Well… I decided not to go back to my old job… I found a new job which fits with what I want hours wise! I decided to go back a little early – I just felt like it got to the point where I was ready to and I wanted the extra money! I went on maternity leave September 17 and gone back into work May 18 so it’s 8 months! Well when I say go back into work… I’m not going back into full time work. I’ve found a part time job, which is 3 afternoons a week 1-5pm which is just so perfect! I have anxiety about being away from Nate and the fact I have 4 whole days with him and then the entire morning with him those days makes me feel so much better! So we can still get up early and do fun things in those mornings! One of the days I work is a Saturday so it means Nate will be looked after by Jak or my mum! So I had 2 afternoons I needed childcare for…. This is when I had to make the decision! Nursery or childminder .. So when I thought about going back to work I always just assumed nate would go in nursery but then I’ve sat down and thought about it! They both have pros and cons … so what it comes down to for me is Nates age. He is 7 months and he’s so tiny still! I’ve chosen childminder for now as I want him to have one on one and to form an attachment! I want it to be a home away from his home! 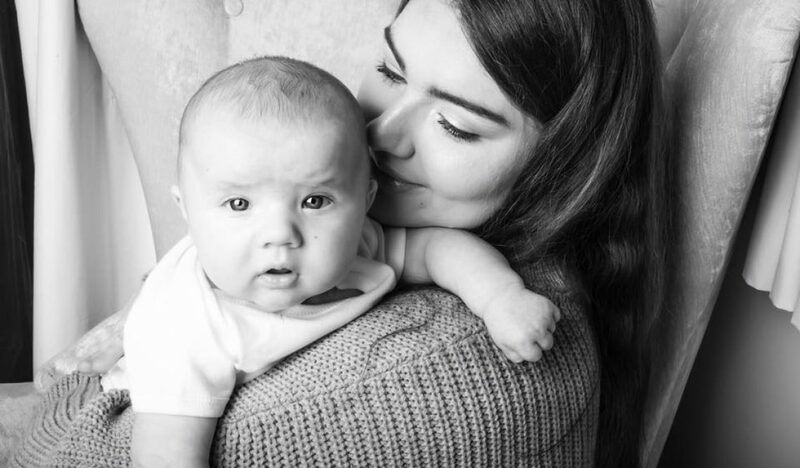 I feel like nursery can be overwhelming for babies and children because it’s lots of new faces so I waned him to just get used to one face – another sole carer! Also I have some friends who have worked in nurseries and I’ve heard horror stories 😭 I’m going to put him in nursery when he’s around 14/18 months when he’s walking because I do believe by then it will really help lots of skills for him. He will be socialising with lots of children & it’ll be fun for him! Hell being doing activities and learning lots of things and will be amazing for his development! But I just think for now – I wanted a childminder when he’s still a small baby! This is all just my view and opinion and I’m in no way saying people who put babies in nursery are wrong etc! Nurseries are amazing and nate will eventually be going to one! Just for how I feel, I wanted to get to know and really trust a childminder! And a home away from home! Also I think I’m going to start visiting some nurseries soon anyway so I get exactly the one I want as wait lists can be long and I want it to be perfect for him and us! He really likes the childminder and she’s so amazing! This has really put my mind at ease! She only has 2 other older children when nate is there a 2 and 4 year old! I feel like he will learn from them & I met the 2 year old and nate was obsessed with just watching him! Watching him run loops round the kitchen! I think it’s key to trust the carer and get to know them so I’ve met her son etc. Honestly it’s absolutely terrifying the thought of placing your child’s life in someone else’s hands! I trust all my family members but this is a stranger! It’s one of the hardest things I’ve had to do but in a way I’ve also looked forward to it! ( mum guilt) but it’s nice to have a small break and have adult conversation! I completely trust the child kinder and she gives me updates throughout the day so this really helps! She said I can message as much as I wanted but I didn’t even message once! I looked at my phone after 2 hours and had 3 updates which was nice! When I first met the childminder she spoke all about her qualifications and she’s been doing it decades! I also saw a portfolio of lots of reviews and references etc! She is the best! Also her certificates were hanging up so I saw them! A childminder is also pretty much half the price of nursery! So if you’re reading this I would 100% recommend looking into childminders! I found her on the government app ‘childcare’ and it shows all the childminders around you then you look at their profile which tells you all about them, qualifications etc! And you can contact them on there. She also had tonnes of games and toys! Prams, travel cots, bumbo seats, highchairs! She has it all! She also said in the morning she does activities with the children like the park or walk, or soft play and then afternoon is chill time! She also works wit another childminder so they do activities together! But as nate will be there in afternoons he will be at the house! Which he will probably nap for 2 hours anyway! I just said to her – I’ve packed snacks etc dummy .. just give him what he wants as long as he is happy but I’ve told her the routine! She gives him lunch and one botttle and has him 12.30-5.30 ! Then Jak or my mum will collect him and give him dinner then il be home! She is only having him 2 afternoons a week and then the Saturday I work Jak or mum will have him! So it’s worked out pretty well! I don’t think I could be away from nate anymore than that! For now! I will eventually go back into fashion buying when nate is older! I received this lovely update today – about how nate is getting on! It’s half term his first week starting so this means the childminder has just got him so it’s an amazing time for them to get to know eachother and he’ll have all the attention which he will love! If you have any questions feel free to get in contact’ I know how stressful and difficult it is! It doesn’t have to be as scary as you think though! !